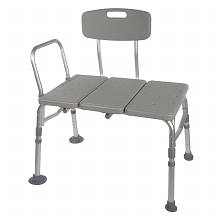 This Shower Bath transfer bench provides additional stability and has a durable blow-molded plastic bench backrest. The height can adjust in 1/2-inch increments with unique dual column extension legs. All transfer benches are reversible to accommodate any bathroom. There is no exposed hardware that could possible injure the patient. Extra large, locking suction cups provide added safety. The tool-free assembly makes it easy to put together. Back, Legs, and Arm limited lifetime warranty. Adjustable Seat Height : 19" - 23"
Carton Dimensions : 28" x 17" x 11.5"
Shipping Weight : 23 lb.